“Venezuela is respected! Neither coup nor interventionism. 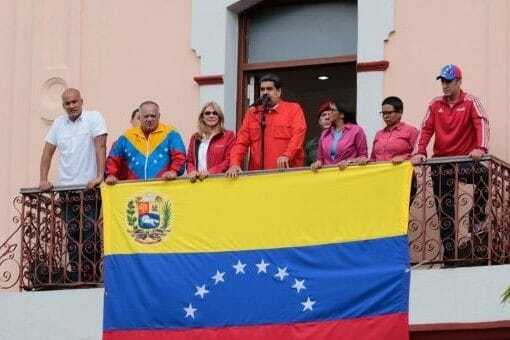 Venezuela wants peace, wants progress,” said President Nicolas Maduro rejecting any coup and interventionist attempts in the country. “Don’t trust the gringo empire. That’s what drives their interest – the desire for Venezuelan oil, gas, and gold. These do not belong to you, they belong to the sovereign people of Venezuela,” warned President Maduro to the Venezuelan people. “It seems to me that it is an absolute and absurd diplomatic imprudence. You can not recognize a government when it has in our own country, recognizing another government with an installed ambassador (…) The decision taken by the (Chilean) Government does not help the Venezuelan democratic process at all,” stated Naranjo. “US Vice President openly calls for regime change in #Venezuela. So-called “rules-based order” promoted by West is nothing more than “fig leaf” of meddling in other country’s affairs. Striking similarities with 2014 Western-backed “maidan” coup in #Ukraine,” stated the Russian embassy in Canada on their official Twitter account. According to Alberto Garzon, coordinator of the United Left and militant of the Communist Party of Spain “There has just been a coup in Venezuela by the Venezuelan right-wing under the protection of the U.S. government. A regrettable classic.” According to him, this has been gestating for several years, and it has not been the first coup backed by the U.S. He hopes that this coup will also be a failure, “so that peace and dialogue are preserved and external interference led by Donald Trump is rejected.” As Guaido has been self-proclaimed as president and was backed almost immediately by the U.S. government “that is backing the coup d’etat.” He also states that this coup, in Spain, is being backed by the far-right, to which Garzon asks: “Isn’t this representative? of what is happening in Venezuela?